Protect the solar system with Banpresto’s Sailor Mars from the Girls Memory series! “Agent of Love and Fire, the pretty sailor suited soldier Sailor Mars! In the name of Mars, I will chastise you!” Well, we’ve never exactly been chastised in the name of Mars. (At least, we don’t think so.) But from the looks of this awesome six-inch figure by Banpresto, it doesn’t seem all that bad. Sailor Mars is captured here mid-stride with a pretty stance, looking onwards as if scouting potential foes and separating them from her galactic allies. Save the solar system and the fate of all its inhabitants with the newest instalment in the “Girls Memory” series, straight from that enigmatic island in the Pacific. Grab Sailor Moon today on CmdStore.com — she’s brand-new and ready to complete your Sailor Moon collection! I wish I could dress like this every day. From Masashi Kishimoto’s Naruto manga and anime series comes skilled warrior Sasuke Uchiha, legacy of a long line of dynamic ninjas. When his brother murders his clan, Uchiha takes it upon himself to avenge their deaths, causing him to become a cold and ruthless fighter. Naruto’s ultimate rival may try to foible him at every turn, but Uchiha is an essential component of the series. Now Tamashii Nations has released this six-inch S.H. Figuarts version of Uchiha, rendered in PVC and generously articulated to re-create scenes from the manga with his lethal katana. Interchangeable face, hand and hair parts allow for multiple aesthetic possibilities. Set him up next to the S.H. Figuarts Naruto and you’re good to go! I got Narutoes in different area codes. The undersea Sailor Senshi with psychic and mirror accessory powers is one of the most ethereal and enigmatic of all the Scouts. The Soldier of Embrace, also known as Sailor Neptune, one of the teenage Japanese schoolgirls who double as freedom fighters on behalf of the Solar System. Both sophisticated and quick to anger, she’s a bit of an anti-hero. But when tempered and aided by her partner Sailor Uranus, she’s able to whirl about the cosmos enacting justice. Check out this six-inch Sailor Neptune figure by Tamashii Nations and its S.H. Figuarts division, a Japanese exclusive for the Tamashii Web Shop. She’s been made specially available to North American collectors, so aren’t we lucky? Completing her set-up are three interchangeable face parts, folded arm parts, praying hand parts, six sets of interchangeable hand parts, a Deep Aqua Mirror accessory and a display stand. From Tokyo toymakers Banpresto comes the vibrant main character from the manga/anime Naruto — the adolescent warrior himself. He’s part of the DXF series, a line specially created to make figures so lifelike they look like they could jump down from your shelf themselves. Realistic PVC molding and a detailed paint job make this Naruto true to original artist Masashi Kishimoto’s design. Naruto stands six inches tall and comes with a display base. Snap him up! I was runnin’ through the six with my Narutoes. Naruto’s Kakashi Hatake is Mega House’s newest statue! An import from Japanese manufacturers Mega House, this 10-inch PVC statue rendering of the well-loved Kakashi Hatake from the hit anime and manga series Naruto Shippuden. He balances sure-footedly on a tree trunk while reaching behind his back for a weapon. A vibrant green scarf and meticulously sculpted hair spikes make him seem as if he’s leaping off the pages of your favorite dog-eared manga. Made of PVC for color retention and maximum durability, you’d do well to consider him as a permanent part of your anime-inspired collection. And don’t forget that Mr. Hatake comes in display-ready window box packaging, dressed in his Anbu gear and prepped for a battle of legendary scale. *ILoveMakonnen voice* I got the mask, and the cloak. I don’t Hatake no mo’. 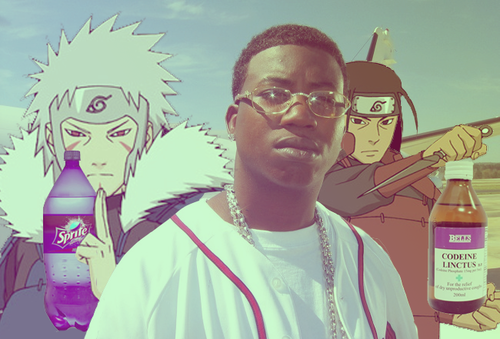 Plus, how can you say no when even Gucci Mane is down for Naruto? Burrr! Imagined in 1992 as a protagonist of the shoujo manga-anime series Sailor Moon, Sailor Mars is the Soldier of Flame and Passion, so crucial for an energetically intense collective such as the Sailor Soldiers! Her impressive spiritual and psychic powers balance out her tendency toward bossiness and narcissism, to the chagrin of her fellow cosmic heroines. But regardless, she’s the crew’s second-in-command, and thus she gains the respect she needs to feel grounded. A standout feature of this figurine comes in the form of its unique articulation — even Sailor Mars’s hair is moveable here, allowing for a diverse range of motion that can place her in any and all action sequences that you can imagine. She is positioned mid-leap above translucent red flames that fade into orange. In her hands, she grasps an arc of fire splayed out to protect and ignite. This Tamashii Nations PVC statue stands five inches tall and is the latest from the Figuarts Zero line. She comes complete with the accessories “Fire Soul”, “Burning Mandala” and “Akuryo Taisan”, as well as multiple hands and facial expressions. Grab Sailor Mars now for delivery in May! Given the constantly-connected vibe of our 21st-century reality, Digimon has easily been one of the most relevant manga, anime and video-game offerings in recent history. There’s no question, then, why Square Enix has set its sights on one of the monsters fabled to live inside a parallel universe created by human communication networks. Here, Alphamon is given the detail-oriented and renowned S.H. Figuarts treatment. Also known as the “Aloof Hermit”, Alphamon’s name is derived from the words “alpha” and “omega”. If this isn’t a clue to his important role within the Digital World, it’s hard to say what is! The Royal Knight announces his arrival with a fluttering blue mantle, ensuring his indispensable presence is known. This Mega-level fighter from the Virus Busters family is characterized by his antagonism towards humans, but we’re sure that if you provide a place on your collector’s shelf for him, you’ll be safe from his wrath! He’ll be shipping out in April 2015, so preorder Alphamon now. In order to digivolve to Alphamon, your Digimon must be at least level 65, with 50,000 Holy experience and you must have previously befriended a Clockmon. Phew! Luckily, copping him in action-figure form is a lot simpler.